We’re testing and launching changes to the manuals format, as the first of our improvement plans. These improvements will roll out over the next few weeks. We’re adding internal search of the contents of a manual, accessed from a search box in the manual’s header. 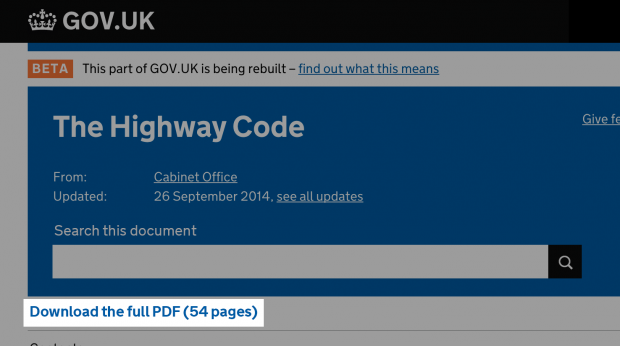 In the first design iteration (above, highlighted) people did not see the link to widen their search to GOV.UK. Following this feedback, we worked with content designers to change the wording of the link, and redesigned the page to make it clearer. 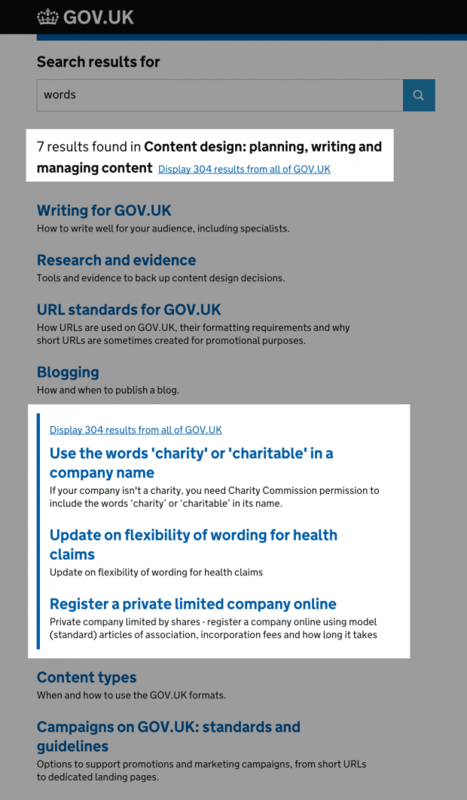 The new design (below) is more radical: it shows the 3 top results from GOV.UK search, a little way into the manuals search results. Displaying results like this should (hopefully) mean users are more likely to discover results that match their criteria. We’ll use analytics to measure what users click on and see how including search results from another search differs from normal search patterns. We’ll also do lab-based research to test how well this design is understood. We’ve surfaced the ability to print individual pages of manuals: if the page contains expanding boxes, the page will print out with all the boxes expanded. We’ve improved print stylesheets so the pages are optimised for printing. 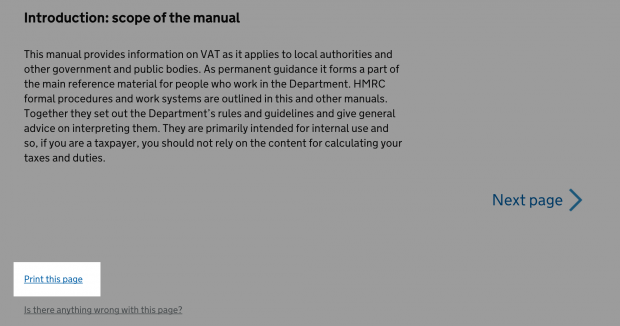 We’re working on making it possible to download a PDF of an entire manual, starting with non-HMRC manuals. We’ll extend this to HMRC manuals next. We received feedback from users that navigating HMRC manuals is tricky, as you have to go back to get to the next section. To address this we’ve added previous and next buttons. We’re still testing and iterating these designs, so we’d welcome your feedback. Rebecca Cottrell is an interaction designer on the GOV.UK core team. Internal search is going to be useful. Keep the good work!